Back To The Kitchen: Happy Memorial Day! Memorial Day marks the first official BBQ of the 2012 summer! It is traditional to fly the flag of the United States at half mast from dawn until noon. Many people visit cemeteries and memorials, particularly to honor those who have died in military service. Volunteers place an American flag on each grave in national cemeteries. This grown up version of a classic warm weather treat will bring a smile to the faces of your guests. Enjoy the beautiful long weekend! Cheers! 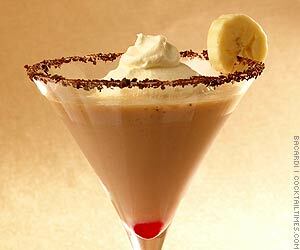 Place bananas, cream, Patron, vanilla and 1/3 cup whipped cream in a blender. Blend on low until smooth and thick. Garnish with extra tablespoon of whipped cream, coffee grounds or chocolate chips and enjoy!